When it comes to relationships, trust is one of the most important things two people can have for one another. In some relationships, distrust and paranoia run rampant, which can make the relationship strained. Both partners should feel like they can trust one another not to do something unthinkable, like deciding to cheat. But how do you know when your partner trusts you enough to know that you’re not going to cheat? Here are the behaviors that reveal your partner trusts you and isn’t afraid you’ll cheat on them. When you’re out with friends, how often does your partner text you? If your partner isn’t trying to pinpoint your exact location when you’re out with friends, then they probably aren’t worried about what you’re doing. Someone who has trust issues is more likely to keep tabs on what their partner is doing, which is bound to cause tension in a relationship where cheating isn’t happening. A partner who trusts you doesn’t need to constantly be checking where you are. Your partner may send you a couple of texts throughout the night just to make sure you’re safe, but they probably won’t be blowing up your phone throughout the night. Someone who isn’t afraid you’ll cheat won’t get jealous at the drop of the hat. When you introduce them to your friends, they don’t shut down or start arguments over the people that you surround yourself with. In fact, when your partner isn’t afraid of you cheating on them, they’re more likely to be friends with your friends. When you say that you’re going out with a certain friend, they don’t get upset. People without jealousy issues are less likely to become worried or paranoid over possible cheating. Strangely enough, having their own life outside of the relationship is a key behavior to a partner who isn’t going to be afraid of you cheating. When your partner has their own life and friends and family outside of the relationship, they’re much more likely to understand why you need those things as well. They’re going to be able to tell when you just need a night with your friends versus hanging out with them. Being with your partner is nice, and you always need to have time together. But being with your friends is important, too, and it’s key to have a partner who understands that need without becoming afraid of someone who will cheat. Communication is key to any healthy relationship. If your partner has a good grasp on communicating their needs, worries, and problems in a relationship, then this is a good thing. Having good communication skills is a behavior that most people who aren’t afraid their partner will cheat. Someone who isn’t good at communication is more likely to be susceptible to paranoia and anxiety surrounding what their partner is doing outside of the relationship, even if they have no reason to be. “… this leads to further issues in the relationship and is usually the root cause of most major disputes,” adds marriage coach Eric Hunt. If your partner has always been capable of voicing their needs in the relationship, then they’re probably not afraid of you cheating. Your relationship should always be built on trust. 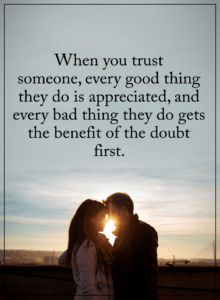 When there’s no trust, there are a lot of problems. Usually, the suspicion of a partner who may or may not cheat can cause issues, especially when neither partner is a cheat. These behaviors should let you know that your partner trusts you to stay faithful and has no fear that you’re cheating on them. On the flip side, the opposite of these behaviors might give you a clue to whether or not your partner is paranoid about cheating. It can help you get ahead, and make sure those issues are addressed right away.